Sony was the first Japanese company to produce an Ampex-type VTR. Ibuka, who believed that Sony's calling was making products for home use, however, was not satisfied with the distinction. He thus directed Kihara and his video development staff to research the use of transistors to create a more compact VTR. In November 1959, they succeeded in producing the first transistorized Ampex-style VTR, which was a big step toward a smaller VTR. Then in 1960 Sony and Ampex agreed to share their VTR know-how. Ampex was anxious to gain Sony's knowledge in transistor application technology. 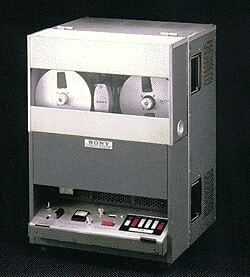 Sony, on the other hand, could learn about VTR technology from Ampex. Masahiko Morizono, who had worked on audio equipment at the Sony audio factory in Haneda, was enlisted to help in this joint effort. Unfortunately, this project did not last long. There were limits to the Ampex 4-head VTR. When any of the rotary heads became work, it was necessary to replace all of them, which was a major expense. Kihara's staff developed a 2-head transistorized VTR in which the individual heads could easily be replaced. After research and testing a total of five trial models using Ampex and Sony VTRs, the end product was the world's first transistorized VTR, the SV-201. This 2-head, helical scan type VTR with a tape speed of seven inches/second (the same speed as an audio tape recorder) had much better performance characteristics than any other VTR in the market. Unfortunately, however, it was neither suited for broadcasting nor home-use. With just 2 heads, the broadcasting companies were not interested. It was also too large and expensive for the average consumer. Sony decided to develop different products for different markets. The result was Sony's PV-100. At approximately one fiftieth the size of broadcast VTRs, it was considered "portable,"and represented a revolutionary breakthrough in miniaturization. Sony announced the PV-100 in September 1962. Less than a year later, sales of the 2.48 million yen set began first in Japan, followed by export sales to the United States. The PV-100 was intended for business-use ie., industrial, educational, and medical applications. Sony salespeople went from hospitals to schools and airline companies selling the VTRs. At the time, most airlines used 8mm and 16mm films for their in-flight movies. Flight attendants, however, found the film difficult to handle. It often rolled off the reels or ripped. The short screening time also made the whole process even more troublesome. Thus, the airlines were very interested in Sony's suggestion of using VTRs instead. In 1964 and 1965, VTRs were introduced on American Airlines and Pan American flights. Sony's job was to provide the "software." In order to deliver new tapes to the airlines on a weekly basis, Sony established the "In-flight VTR Service," a VTR duplicating factory in the suburbs of New York. This was seen as a sure money-making venture. However, flight attendants seemingly did not treat tapes with much care. Flight attendants would jam the open-reel tapes while threading them or leave them near the beverage trays, where inevitably coffee would spill over them. The original estimate that the tapes could be used at least forty times was completely off target. Most tapes came back in pitiful condition after just one use. Despite these troubles, Sony was relieved that the VTR, which was originally considered marketable only to broadcasting companies, had come one step closer to consumers. In addition, the basic technology behind this VTR developed by Nobutoshi Kihara and Masahiko Morizono was passed on to the 1-inch Omega VTRs and half-inch Betamax VTRs. The applications of the transistor had expanded by leaps and bounds -- from the radio to the television and then the VTR -- just as Ibuka and the others had dreamed. Around this time, Saburo Uemura of Sony's Research Department began toying with the idea of using transistors in an electronic abacus. At Atsugi there were buckets of rejected transistors. Although their yield was not high enough for use in radios and televisions, they could surely be used in digital circuit switching. Uemura produced a prototype with over a thousand transistors. He had not intended to develop the electronic abacus for sale. The trial model was still very rudimentary as far as calculators go, but it was rated fairly well. With this, Uemura set his mind to designing a truly functional calculator. Uemura believed that, "Sony may be profiting from transistors today, but in fifteen years or so digital devices will be just as important." Ibuka, however, was stubbornly against the idea. "Our products are for the consumer. An electronic calculator just won't sell." Uemura remained firm. "These calculators make use of rejected transistors, so production costs are nominal!" Ibuka was still not too happy about the matter. Thereafter Uemura did his research out of Ibuka's sight. Eventually Ibuka discovered it and gave Uemura a sound bawling out. Ultimately, though, Ibuka gave in -- if Uemura was so obsessed with the idea, then let him try it. Ibuka gave his consent on one condition: "I'll let you work on a replacement for the abacus, but I won't allow you to design a mainframe computer!" Uemura and his staff had set their sights on a compact electronic abacus, "Sony size." Thanks to advances such as the Esaki Diode, computer research was advancing at a phenomenal pace. Most of it was aimed at building larger and faster computers. Uemura's goal was the exact opposite. Their calculator was to be small and lightweight, with quick computing speed, although it did not have to be as fast as IBM's mainframe computer. Until this time, no one had given this area of research much thought. Uemura first tried using the Esaki diode in the calculator. He found that it was not suitable for the low voltage calculator that he was aiming for. Thus, he began independent research. The challenges included designing low voltage circuits, determining what form the display would take and deciding what to use for memory. Late one summer day in 1962, Uemura's team stood tensely before Ibuka and other top Sony officials. Ibuka and the others were gazing at their first completed MD-3 calculator. The calculator, connected to an electric typewriter, was designed so that the answer would be typed on paper. One of the directors tried it, punching in a multiplication problem. Uemura and his staff watched anxiously as he pressed the equal sign. The typewriter suddenly sputtered to life; ta-ta-ta-ta-ta-ta-ta...! To everyone's relief, the correct answer came scrolling out the typewriter. Transistor problems aside, the miniaturization of the TV presented other unforeseen problems. Sony's top directors acknowledged Uemura's calculator. It was still far from perfect, though. Prototypes 1 and 2 were produced. A relatively slow computing speed was acceptable. The next step was to develop silicon transistors, silicon diodes and miniature high-resistance hybrid ICs, with their main concern being to keep voltage consumption as low as possible. Then in March 1964, the world's first all-transistorized desktop electronic calculator was perfected. Sony's MD-5 calculator, which used ICs, was a big hit at the 1964 New York World's Fair. Besides, the world's first transistorized desk-top calculator, Sony's micro-TV, background music machine(MD-5), and VTR were selected together with a model of the gigantic tanker, "Nihon Maru," to represent Japan's technological advances at the Fair. The MD-5, capable of computations up to 8-digits long, was praised for its ease of operation. Until then, calculators were only capable of addition and subtraction. Multiplication, for example, was done by adding the same figure over and over again. This calculator, however, worked like the human mind -- one would press "1+1" then the "=" sign, and "2" would appear. Such a simple operating system was a major innovation. With a familiar format like this, the calculator would have a much broader appeal. Anyone from a housewife to a student could easily master it. The MD-5 used magnetic switching and a Nixie tube display which made use of the Burroughs patent. At the time, there were calculators which used the discharge tube in United Kingdom, or mechanical relay switches elsewhere. Uemura's calculator substituted transistor switches for the latter. This attracted the attention of American researchers engrossed in the development of large-scale computers. In this sense, Uemura's work was a great success. The "M" of MD-5 referred to Minerva, the goddess of wisdom. "D" was the trial model number. The research and development engineers were fully confident that Minerva was on their side. The project moved from the R&D stage down the long road toward mass production. First, they had to further improve its functional operations. Model MD-6 incorporated a decimal point. Then came MM-7, another step in the direction of being compact and lightweight. It was appropriately nicknamed "Micro-Math." Each successive model incorporated some new feature or improvement. MX-11 was the experimental model of the ICC-500 SOBAX, the electronic desktop calculator, which appeared on the market in June 1967. 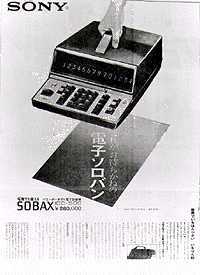 SOBAX was a name coined by Hatoyama that meant "solid state abacus." (The abacus was also known as "abax." ) He chose this name because it referred to its ease of operation and capacity to do complex calculations at high speeds, similar to the abacus. After Sony's development of the MD-5, electronics makers around the world began to enter the portable calculator business, which accounts for the popularity of desktop calculators today. SOBAX, however, led the way to the extraordinary popularity of desktop calculators. Operating systems in most of today's calculators are derived from this SOBAX. They include the disappearing 0 feature (0's in columns to the left of the number disappear from the display), the floating decimal point, the "rounding off" feature, percentage computations and reciprocals. Because of its unprecedented capabilities, SOBAX was put on display at the Smithsonian Institution in Washington, D.C. Still, with a price tag of 260,000 yen, the ICC-500 was a far cry from being a replacement for the abacus. What housewife would use a 260,000 yen calculator to do household bookkeeping? It was decided that it could only be marketed toward design or accounting companies. However, these people were used to mechanical calculators and had misgivings about readjusting to a new operating system based on the computing processes taught at school. From a marketing perspective, SOBAX was far from a success. On January 23, 1963, Sony acquired land and a building located in front of Osaki train station from a company called Sonoike Seisakujo. 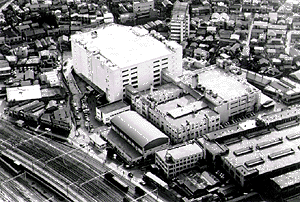 This was to become Sony's Osaki plant and the center of transistorized television production. The new plant was a convenient 2-minute walk from the train station and a 10-minute walk from the main plant in Shinagawa. The site encompassed 13,800 square meters. Of this, the 4-story building with a basement took up 12,000 square meters. The plant, which was still under construction, was turned over to Sony in May of 1964. As the plant was to start full transistor TV production by that autumn, remodeling work on the building was undertaken immediately. Building costs were to be covered by the capital acquired from Sony's second ADR issue, which had taken place that April. The second ADR issue was a great success, as the 3 million shares were all sold within an hour. This capital was needed to push along the development of the VTR and color television and the mass production of the micro-TV. To be truthful, at this point in time, Sony needed all the money it could get. The color TV, in particular, required a big investment. Sony, having a late start in color TVs in 1961, first pinned its hopes on the chromatron tube, which produced a display six times brighter than the conventional shadow-mask. Until that time, however, it had been limited to specialized military use. Despite the technical difficulties involved in producing the chromatron tube, Ibuka and Morita decided to adopt it. The economics of production were stiff -- a single cathode-ray tube envelope cost $200. In the days of 360 yen to the dollar, this was equivalent to 72,000 yen. Ibuka, however, believed that costs would decrease with mass production. Iwama oversaw all work related to cathode-ray tubes. Susumu Yoshida led the production team of Koichi Momoi, Senri Miyaoka, and Akio Ohgoshi. Satoshi Shimada led work on circuits. The crux of Lawrence's chromatron theory is that an electron beam from an electron gun could pass through the color switching grid of woven wires (the predecessor of the aperture grille) and be irradiated against the red, green and blue fluorescent material on the screen. According to conventional optic theory, when the beam directly strikes the grid, the shadow of the grid is reflected on the fluorescent screen, resulting in a darker picture display. Since the electron beam passes through the grille, it is possible to utilize over 80% of the electron beam -- resulting in a brighter screen. Theoretically, Lawrence's concept was superb. When the Sony crew began to develop it for operational use, however, they ran into various practical problems not addressed in Lawrence's theory. Even if it was constructed to specification, the man-hour costs alone put it far beyond production feasibility. Although there were still problems, the 19-inch Chromatron color TV, employing the single-gun, high fidelity dot sequence method was tentatively completed in September of 1964. The Chromatron color TV was shown to the press and was the focus of much attention. This commercial product was Sony's fifth after the tape recorder, transistor radio, transistor television and VTR. Production was assigned to the Osaki plant. After having announced this new television, Sony's reputation depended on fixing the bugs that still plagued the set. Now more than ever, the research team faced a long uphill battle.